I started my weight loss journey in November of 2015. I had recently had a baby, and back surgery, and knew that it was time to get my body as healthy as it could be. I felt completely broken, not just on the outside, but on the inside, too. When I walked into Weight Watchers that November I told myself I couldn’t quit. I wasn’t allowing myself to give up again, and there was no time limit on my journey. It didn’t matter how long it took, I was in it this time for the long haul and no matter what. My “why” was greater than it had ever been. Fast forward to August of 2017. I’ve been a Weight Watchers member (this time) for 643 days. (Yes, I had to look that number up 😉 ) There have been a lot of days that this journey has been easy. It’s been easy to make good choices, and get my workout in, and drink my water… yada yada yada. But, there have also been a lot of really difficult days during this time, too. This past week was one of those times. We sent our oldest son to kindergarten this week and he’s struggling at drop off. He’s terrified of not finding his class so I’m dropping him off in tears on the sidewalk inside and watching him walk in with tears streaming down his cheeks and a teacher holding his hand. This week has been so emotionally draining, and to be honest, I wasn’t really prepared for it. I knew I’d struggle, but didn’t think he would, and that’s added a whole new level of struggle for me. I had to practice a lot of intuitive eating this week and remind myself that bingeing was not going to make this any less difficult, in fact, it would make me feel worse. I needed to feel the emotions instead of shoving them down with food. I wasn’t perfect, I had some moments that I let myself indulge, but I didn’t let myself feel disappointment or regret about it. There is a difference in indulging and bingeing. Indulging is enjoying the food, and having a clear mind about it with no guilt afterwards. Bingeing is using food as a drug to avoid “feeling” an emotion that makes you feel uncomfortable. There is a difference. There shouldn’t be guilt about indulging, in my opinion. It’s ok to indulge, but bingeing is another monster. Mid-week I started to feel frustrated that the week wasn’t going the way I’d like, and I’d most likely see a gain on the scale at my Saturday morning weigh in. That’s when I laced up my shoes, and got outside. I went on a walk and unplugged. On that walk I forgave myself for any negativity I was feeling about how the week was going and allowed myself to accept this week as it was. Sometimes this journey is accepting yourself exactly as you are and accepting the circumstances that you cannot change. Sometimes that means the scale isn’t going to move, or it’s going to go in the wrong direction. THAT’S OK. This journey of 643 days has not been full of perfectly on plan days. This journey has had many bumps and bruises. That’s the real lesson here, embracing the imperfections that are inevitable. 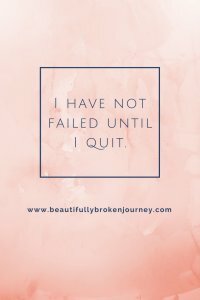 I have not failed until I quit. And, you won’t see me quit. Part of embracing your beautifully broken journey is accepting that this journey will not be perfect. It’s not perfect for anyone. If you are seeking perfection, you are going to be disappointed in yourself often. We are human. We are not perfect, that’s the job of Jesus. Our lives are filled with circumstances out of our control and we need to learn to do our best when those situations arise, and when we don’t do as well as we would have liked, we need to learn to offer ourselves grace for the journey. I showed up at my meeting this morning knowing the scale was going up. I took it as information, and nothing more. The scale does not define me any longer. I am not that number. This week, I was a first time kindergarten Mom who put her heart and soul into her son, and my weight loss journey took a back seat. That doesn’t make me a failure. That makes me a success because when I walked through those doors and committed to a healthier life 643 days ago, that meant staying true to that promise through the good days, and the bad days. That meant making healthy choices as often as I can, and when I fall short, forgiving myself and moving on. 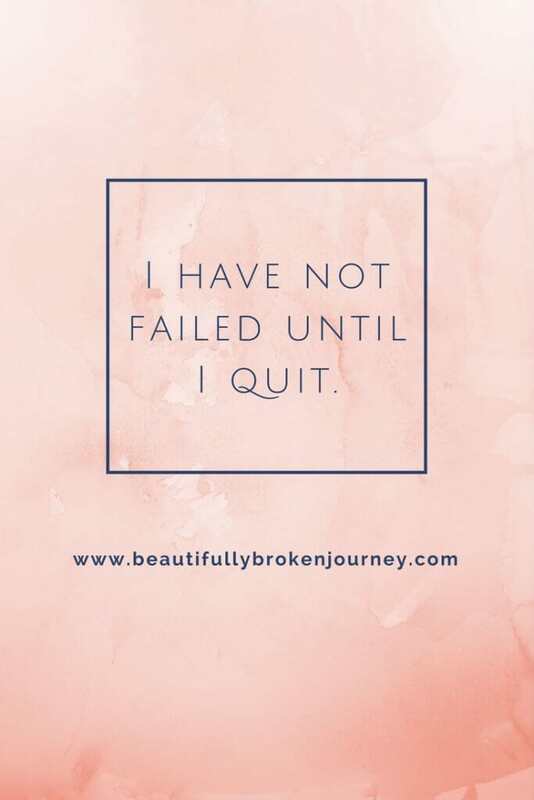 That meant I won’t allow myself to ever give up again, because I am worth the work and I am worth living a life where I have found freedom from food. I am no longer a girl who bases her value on the number on the scale. I am no longer a girl who puts so much pressure on herself she constantly feels suffocated. I’m so glad you know you are worth more than the number on the scale, Suzanne. And great job getting up and moving!! Amy, I just wanted to thank you for your words. You motivate me, you inspire me and you keep me going. I can so relate with everything you say. It’s all about not giving up, enjoying the journey with its smooth and bumpy rides. It’s about believing and trusting. Thank you again. I know somewhat how you’re feeling with your baby going off to school. My eldest and I went through the same tearful struggle. Day after day for two weeks. I’d walk him in and the teacher would hold on to him as he cried out each morning “mommy don’t leave me”. It was awful, as I would have to leave my baby terrified and crying. But the teacher and principal assured me- “give it two weeks”. And they were right! The start of the 3rd week, my son said: mommy you don’t have to walk me in anymore. Fast forward 18 years and we both can laugh at it. But you know… he’s my most affectionate and loving son. So maybe some good will come from this. May you have strength and endurance. Thanks so much, Hannah. He’s doing so much better already, praying next week is even better! Thank you for taking the time to help others. I am 57 yrs old and have been in and out of WW since the 1990’s. I have never reached lifetime membership…. one time I got within 5 pounds and then blew it because of life events. I am hurting inside and nobody really knows it. My goal this time is to do better and hopefully become a lifetime member so I can become a WW leader. I would like to help others people that struggle with weight. The self hate talk for me is huge….and huge isn’t even big enough to describe it. I have a sugar addiction I am trying to break or control it. I can walk the walk and talk the talk ….but I am so sad. I need to beat this once and for all but sometimes I just feel too old. I have wasted my life being miserable in my own skin and it hurts, but people would describe me as happy go lucky and a real people person. Maybe your blog will help me. I don’t feel quite so alone after reading you blog. Sharon, I hope you can find the source of your unhappiness and find a way to overcome it. I’ve felt that exact way, it is true that many don’t realize how sad we actually are inside. We can put on quite a front if we need to! I encourage you to find someone you can open up with and share these feeling with and hopefully that will help you break down the walls and lead you into a relationship with yourself that is centered in love and acceptance. I simply cannot give this post enough love! I think about this all the time — how feeling my emotions is so hard, and how experiencing physical pain is so unpleasant and makes me so cranky. And you are so right , that the first rule is self-forgiveness. The second rule is to lace up the sneakers and go! Also, you gave me a great mantra: “This journey has had many bumps and bruises. I know there are more to come.” Food won’t make that any better. So glad this post resonated with you, Jonathan!